Global eCommerce Technologies provides EDI (Electronic Data Interchange) consulting services to take the frustration out of the time consuming process of managing EDI-based applications and documentation. We specialize in assisting clients with managing multiple EDI trading partner implementations, rolling out new EDI documents across a large number of trading partners and developing EDI specifications tailored to organizational needs. Our expert EDI Consulting project leaders are prepared to assist or entirely manage any project for clients and save them the resources of time and effort with targeted solutions. 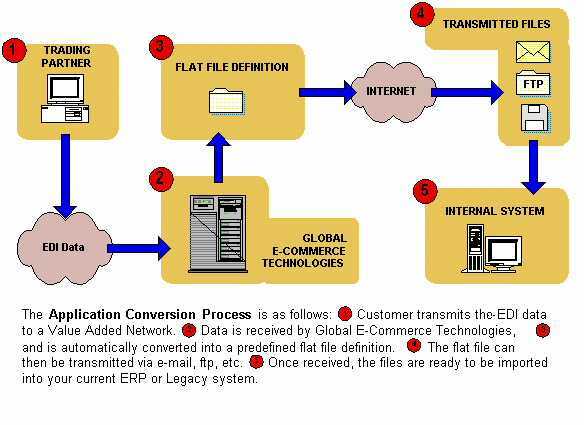 Global eCommerce Technologies provides EDI consulting that results in not only faster processing cycles and reduced costs but improved accuracy and a competitive edge. Clients wishing to reap the benefits of outsourcing EDI management are able to do so with Global eCommerce Technologies outsourcing programs. Simply send files to the Global eCommerce Network and our translation service converts documents into those required by customers and suppliers. We provide “EDI compliance” services or EDI outsourcing for vendors who are not equipped with EDI processing capabilities. Global eCommerce Technologies offers two specialty outsourcing solutions: application conversion and manual processing. Simply stated, we convert EDI data to and from Customized Data Files for use with a spreadsheet, ERP or business applications. Clients interested in EDI outsourcing do not need to have any experience in EDI to comply with a trading partner’s electronic processing requirements! 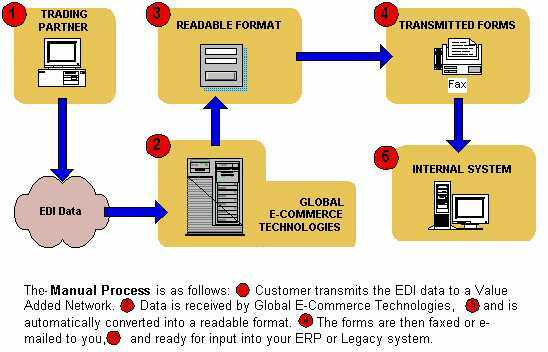 The Manual Processing program for EDI outsourcing entails conversion of EDI data received from trading partners into a readable format and then sending it to clients via mail, fax or e-mail. We also translate information clients fax or e-mail us into an EDI format that is returned to trading partners. As with our application conversion outsourcing process, clients do not need to have any experience with EDI to comply with a trading partner’s electronic processing requirements. Receive fax or mail copies of the EDI documents in a form so that you are familiar with the look and the content of the documents. Transmit via fax or mail outgoing documents so that it can be converted into EDI format. The requirements for the EDI Manual Processing program is short and simple: a reliable fax machine is all that is needed. Are you interested in learning more about the benefits of our EDI consulting services? Contact us via our web form or by calling 786-571-6763 today.